Mithranandapuram Vamanamoorthy Temple, Peruvanam of Thrissur District of Kerala is a place of worship of great antiquity and is believed to be more than 1,500 years old. So is the idol in Srikovil- sanctum. 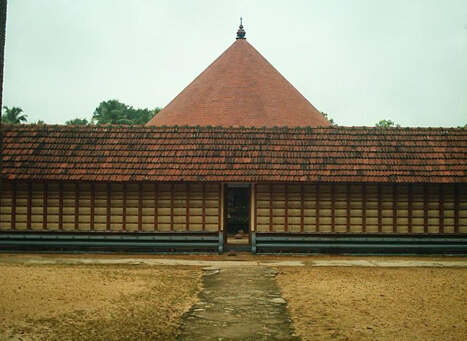 The Malayalam recital "Ayathu Sivalokam" depicted in the nearby Arattupuzha temple confirms the age of this temple where Arattu pooram called Deva Mala is celebrated. The mythological story is a known one and a few of my posts on Kerala Vishnu temples refer to the legend behind Vamana avatar of Lord Vishnu. 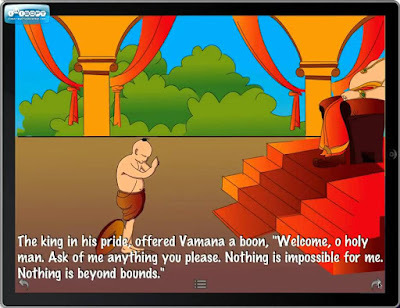 In order to subdue the ego of Mahabali, a demon (Asura) king, who wanted to rule the whole world (Heaven, Earth and Underworld), Mahavishnu, in the guise of Vamana - a dwarf saint, demanded three paces of land from the demon king who was well known for his charity. The demand being amusing, the king granted the wish of Vamana. In a jiff, Vamana grew in size to cosmic proportion and covered the earth and and the sky in two paces. 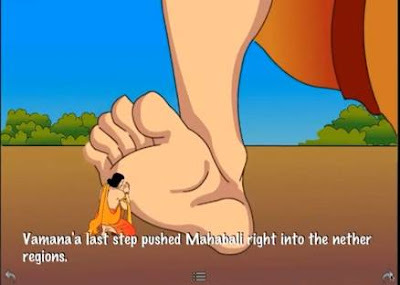 Mahabali, who never went back on his promise, offered his head to the lord to fulfill the 3rd pace. God Vishnu pushed him into the neither world for good and blessed him with immortality and also salvation for his indisputable charity. He advised him to get rid of pride and presumption that won't do good to any person and told him about the benefits humility. However, the lord allowed him o visit his land Keralam once a year to meet his people. On special days like Thiruvonam, Prathishta Dinam, Othukottu, lunar and solar eclipse, temple puja timings vary from normal timing. 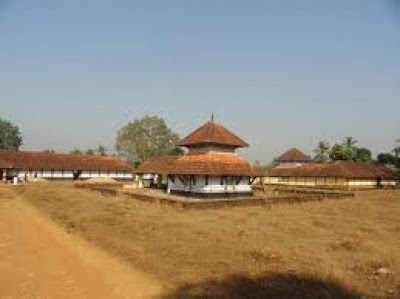 Sampoorna Yajurveda Yajna or Othu Kottu, Yajurveda Samhitha recital are some of the puja rituals here. A rare feat at this temple is the recitation of entire text of Yajurveda once in every three years by Yajurveda scholars/pundits from parts of Kerala. The Yajna is conducted by 10 Namboodiri families of the locality. Thiruvonam in Chingam (Bhadrapada) is the birthday of Lord Vamana, the 5th avatar of Lord Vishnu. In his memory, the temple conducts Thiruvona Oottu on Thiruvonam day in every month. On the day, Kalkazhukichu Oottu to Brahmin children is performed in the morning followed by Akhanda Nama Japam, Prasada oottu and Niramala in the evening. Lots of devotees sponsor Thiruvona Oottu and bear the expenses. Yet other important, but special puja rituals - vazhipadu are Bhoomi Pooja and Bhoomi Danam. The are performed in memory of Mahabali who donated three paces of land to Vamana (Lord Vishnu). The belief is that if these pujas are done any legal litigation arising out of landed properties will be solved amicably, thus reducing anxiety and loss of money.